How to maintain Water tightness, Seaworthiness, Fire integrity and Security of Cargo ships ? To maintain Water tightness, Seaworthiness, Fire integrity and Security of the vessel, it is important ships personnel ensure all openings to hull below water line and above waterline ( weathertight & watertight doors etc.) are adequately secured. Weathertight door means a door fitted in a structure above the freeboard deck. It must be of adequate strength and able to maintain the watertight integrity of the structure. Weather deck is the deck which is completely exposed to the weather from above and from at least two sides, (SOLAS). 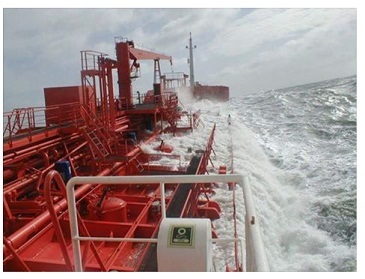 Weathertight means that in any sea conditions water will not penetrate into the ship, (ICLL). A weathertight door/ fitting shall have a strength at least equal to the bulkhead or deck in which it is fitted. Watertight door means a door which is fitted in a watertight bulkhead and able to open vertically or horizontally. It is operated by a hydraulic mechanism either locally or remotely. It must be substantially constructed and able to withstand the total hydraulic pressure of the adjoining compartment if it floods. It capable of preventing the passage of water through the structure in either direction with a proper margin of resistance under the pressure due to the maximum head of water which it might have to sustain, (ICLL). In practical terms, the difference between weathertight and watertight is that a weatertight fitting shall withstand water pressure from the outside (be watertight from outside), whilst a watertight fitting shall withstand water pressure from both sides. Watertight Integrity Plan – A drawing showing the main and local watertight subdivision as well as internal openings and closing devices thereof. The drawing is essential for the local class surveyor to ensure that proper watertight integrity measures are taken during the building period. All sounding & ullaging pipes, and where applicable, peep holes. a) If for any reason, any watertight or weather-tight openings are opened at sea, permission must be taken from the Master as the case may be, and same closed immediately after completion of work and reconfirmed to the Master. b) The Chief Engineer shall ensure that the watertight doors in the machinery space, Shaft tunnel watertight door where fitted, are closed at all times, unless the space is manned. Since Fire prevention construction may function normally, where in Fire doors are properly closed, there should be no hold-back arrangements fitted to any Fire doors and all Fire doors must be adjusted to close fully at all times. a) All restricted spaces, as mentioned in the Ship Security Plan, are to be always kept closed in port and in piracy-prone areas. b) Such closures serve the dual purpose of safeguarding both the safety as well as the security of the vessel. How to restore power after a collision accident with another vessel ? Missing person reported after a collision accident -how to deal?